Want to play a piano without touching any keys? Look for noisy mechanical crickets hidden in cupboards? Maybe even let out an ear-splitting scream without disturbing anyone else? Then you may want to head for the Montshire Museum of Science in Norwich, for a new exhibit about sound called "Sonic Sensation." It opens May 26 and runs through September 4. Exhibits Director Bob Raiselis says he hopes visitors will really open their ears. "There are sounds all around us that we tend not to notice all the time," he says. And he wants this exhibit to put those interesting clicks and clangs and whoops on display. But you may have to work to find them. Or maybe even make them. "There are exhibitions about matching sounds, about high pitch and low pitch, about how sounds are made, about how we hear sounds. There’s an exhibition called critters in the cupboard, which invites you to find a cat or a cricket inside a set of kitchen cupboards and you discover that crickets are easy to miss, cats are easy to find." Raiselis says. To demonstrate, he strolls over to a bank of low wooden cupboards and starts opening doors at random, guessing which has the cat and which has a cricket. It’s not easy. Maybe to evade capture, crickets make sounds that seem to dissipate in the environment, while cats seem to wail "Look at me! I’m over here." Nearby, a big computer screen hanging from the ceiling shows the notes of a digital piano-but you don’t need to touch it. You just wave your hands in front of it to make music. If you want to let off some steam, you can let out a scream in a soundproof chamber, which will register the volume in a digital read-out above the door. 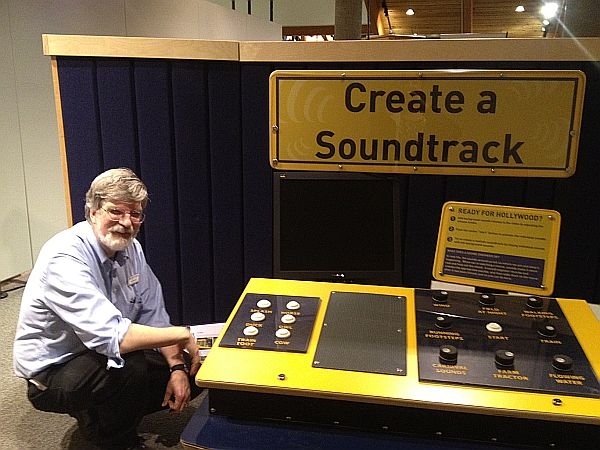 There’s even an exhibit that lets you make your own movie soundtrack. "So the movie runs and you are presented with a series of sounds and you can add them in to the right spots in the movie to make the movie sound plausible or make it sound very bizarre," Raiselis explains. "So you can have a cow mooing where a cow shouldn’t be mooing. Things like that." Sonic Sensation runs inside the museum through the summer. And the permanent collection also offers plenty of year-round chances to make exotic sounds outdoors, like whispering through tubes that amplify voices, or whacking pipes with mallets. It will be a noisy field trip, but, parents and teachers say, a worthwhile one.